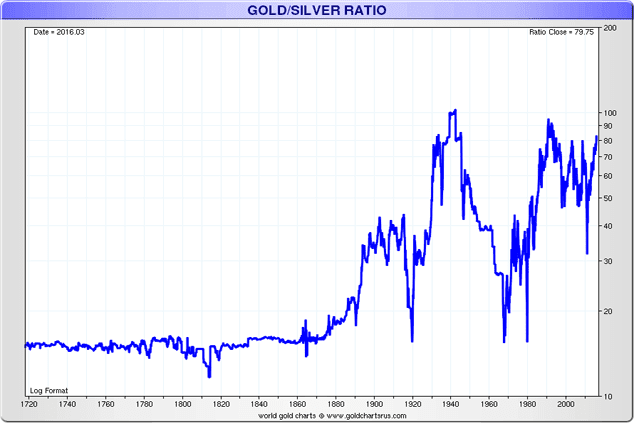 The following chart provides a visual of the gold/silver ratio going back hundreds of years to 1720. The gold/silver ratio is the price of gold divided by the price of silver, and it helps determine when one of the two is expensive or inexpensive relative to the other. You can see that for about 160 years the ratio hovered at about 15 to 1. There is 15 times more silver available to mine in the earth's crust and since there were no central bankers to print paper dollars and gold and silver were real money, the ratio tended to hover around the natural supply. Last year 27,579 tonnes of silver was produced in comparison to 3,000 tonnes of gold (9 to 1 ratio). I believe over time gold and silver will move back toward the historical ratio of 15 to 1. I don't believe this will occur due to a sharp decline in the price of gold, but rather a violent rise upward in the price of silver. As I write this morning gold is priced at $1,240 and silver is $16.35 (a 76 to 1 ratio). A 15 to 1 ratio would put silver at $83 if gold stays fixed at its current price. I believe over time, gold will be moving higher, creating even more opportunity for silver if the ratio converges. Buyers will want to know the exact day silver will bottom and begin to make its move higher, and the day they should sell. Of course; I have no idea. I continue to accumulate physical at these prices, and because I have no plans to retire any time soon my hope is the paper dollar value will stay this low for a long time to come.